Tea Sipping at Home. 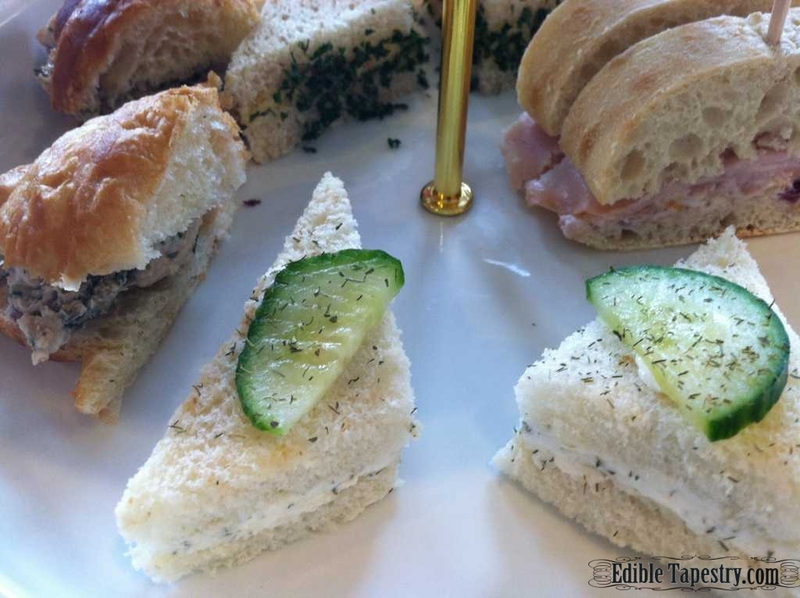 Some of my favorite “local” tea room experiences. Tea is life. Well, a big part of mine, anyway. Even as a toddler I was sipping it, prepared with cream and sugar by my tea loving German mother. I remember her once taking me on a lunch break from my dad’s chiropractic practice, where she worked as his office manager. While we were out and about, downtown on some errand, there was a stop at a discount store. She told me I could pick out one of the little ceramic tea sets they were selling. I remember going back to the office and trying it out with the tea she brewed for me. We had one sip each, with the tiny cups that came with the set. And the miniscule teapot didn’t hold much, either. But I LOVED that little tea set. It had bears on it. I wasn’t fond of dolls when I was a little girl, but I loved, and still love, animals. Mom and I have been having tea together, ever since. 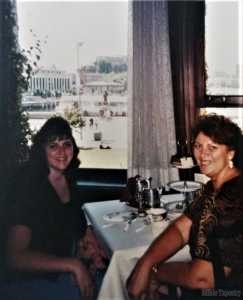 When she came to visit me in Washington state, we took the ferry to Victoria BC to have afternoon tea at The Empress Hotel. My husband and I had done the same thing two years earlier for my birthday, which is when I knew I wanted to take my mother there if she was ever able to make the cross-country trip to visit. When she did, she created one of my favorite memories that we still giggle about today when she accidentally shot a sugar cube across the room with the little tongs that were provided for our tea service. “Julia Roberts escargot Pretty Woman style”, as we call it. If you’ve ever seen the movie, then you might remember that her character launched an escargot from its shell into the air, where the waiter caught it. The waiter did not catch Mom’s sugar cube. We have no idea where it landed. And when she blew through cancer, knocking it out in record time, I took Mom to have afternoon tea at The Inn on Biltmore to celebrate. Set in the turret of the inn, with sunlight streaming through pretty windows of the library, it was a beautiful, special treat I will never forget. Though Mom started me on this tea obsession of mine, she doesn’t always make it to my favorite local tea shops, when I move place to place. 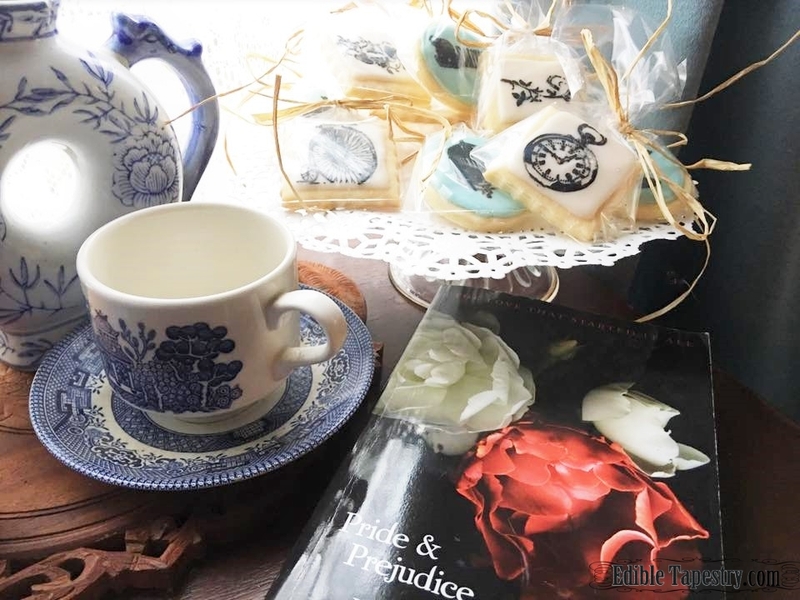 Two of my favorites in Washington state to have tea were the Victorian Rose Tea Room in Port Orchard, later owned by author Debbie Macomber, and Ye Olde Copper Kettle in Poulsbo. Victorian Rose was changed from it’s pinky-pink exterior I was familiar with to gray and renamed The Grey House by Macomber. 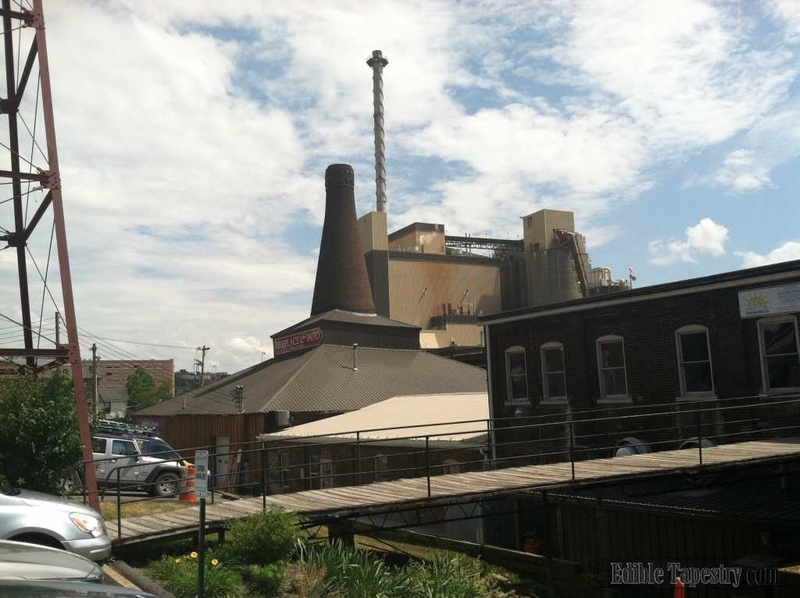 And I am so sad to see that the Copper Kettle is gone. It was such a great little shop, with meat pies and tea and scones with clotted cream and lemon curd! 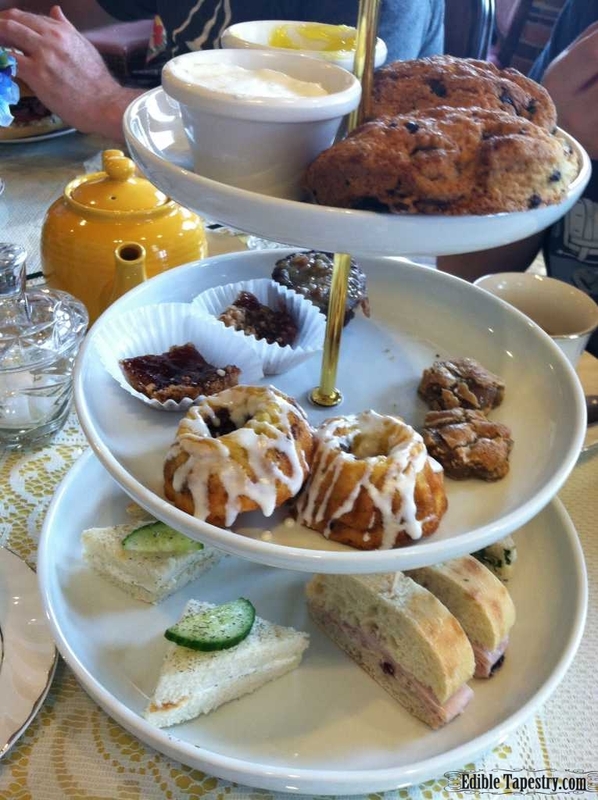 I was so happy to find Chelsea’s Tea Room in Asheville when we moved to the area after living in Washington. For several years, I would win the vote for where my family would have lunch out, and Chelsea’s was IT. 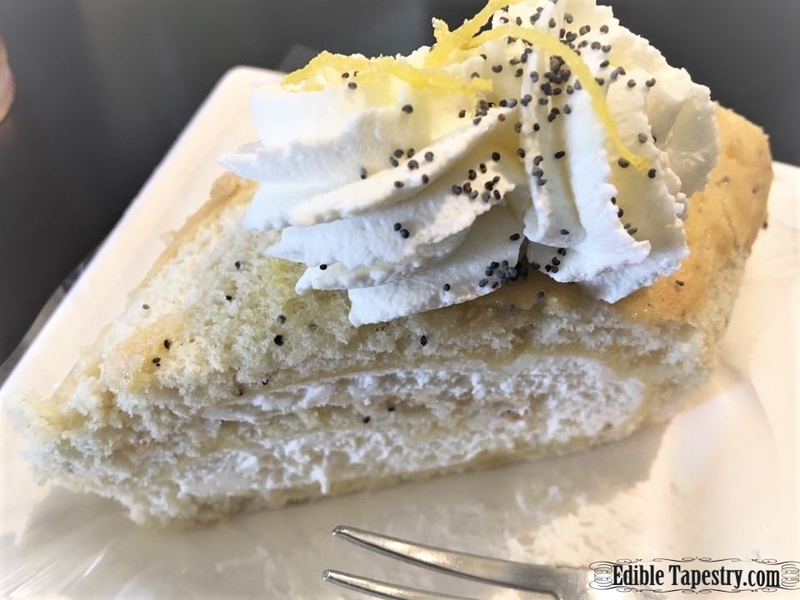 My husband and kids would sit with me sipping tea and eating pastries from yet another tiered cake stand full of goodies. But, sadly, Chelsea’s is also now gone. 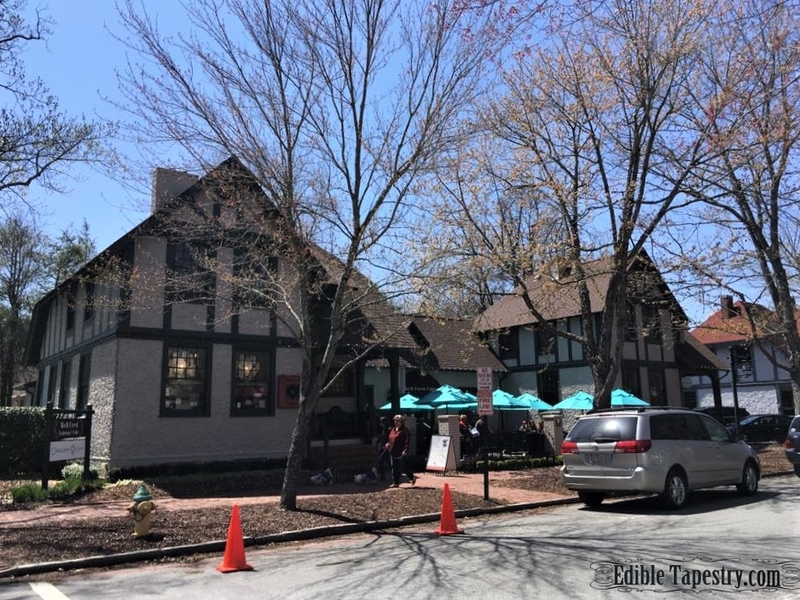 Though I miss the light and airy tiled tea room and the Victorian tea shop that was part of Chelsea’s, I can’t complain too much that it is gone, because I happen to adore the bakery, Well-Bred Bakery of Asheville, that has moved into that space. And, of course, I can still have tea and pastries at Well-Bred, even if it’s not quite the same thing. 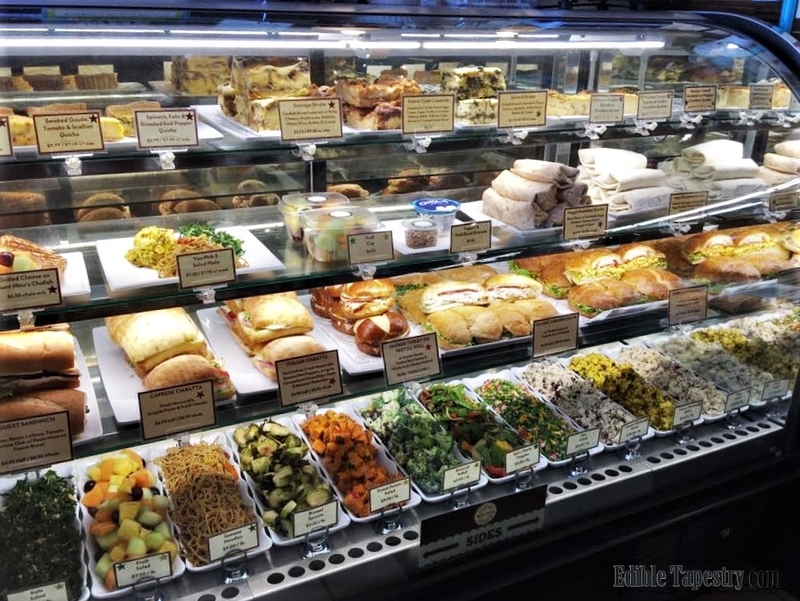 Try their chicken salad, if you ever make it to the bakery. Fabulous! And so great on one of their croissants. All of Well-Bred’s salads, even chicken, can be ordered as a side dish. Great for low-carb dieters who may be wondering how they found themselves in a bakery and what they can possible eat that’s within their limits. But that leaves me with no local tea room with frilly Victorian spaces to enjoy. 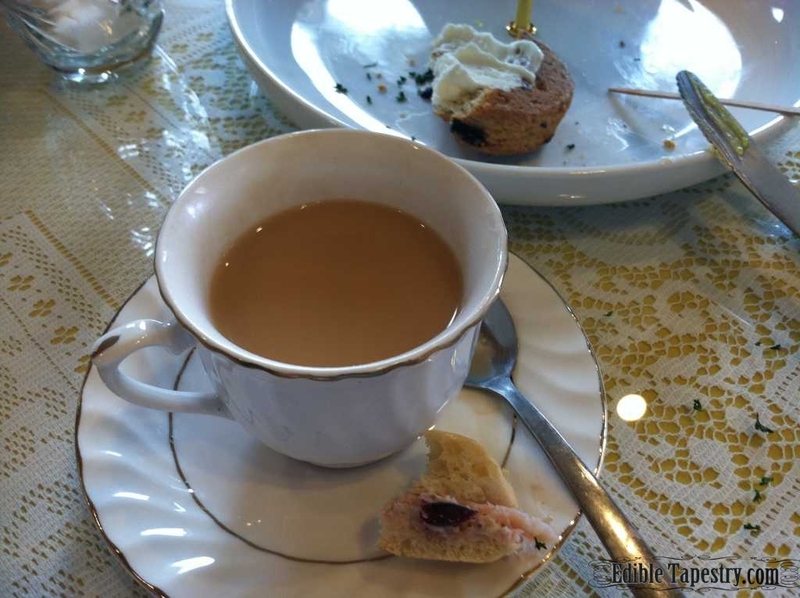 Though there is always Inn on Biltmore’s Library Lounge, I really miss having a small local tea room. I might have to do something about that, one day, and start my own! Maybe in a little Victorian cottage? When we were part-timing it in WV, I did have access to a perfectly wonderful tea room in Morgantown. 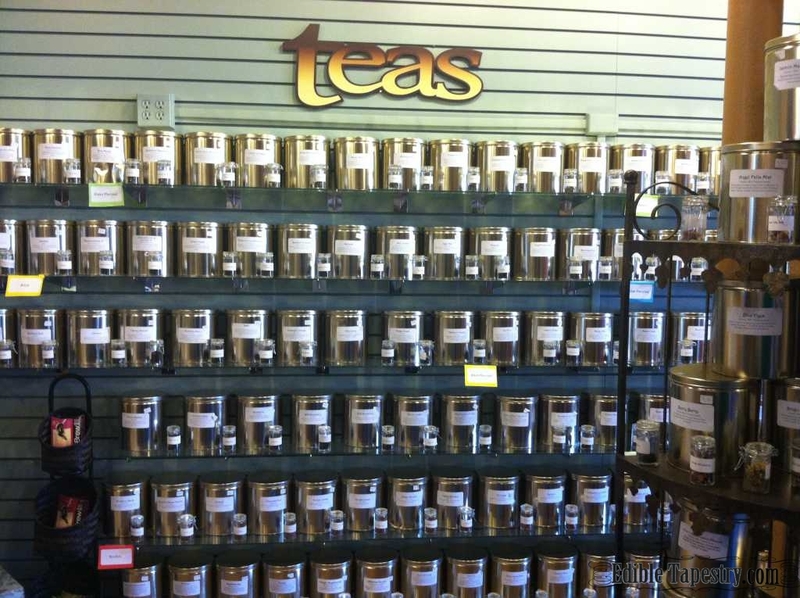 The Tea Shoppe at Seneca Center. It is still operating at full swing, thank goodness, so any time we stop by on our way north I can sit down for my favorite cup of Dorian Grey (an Earl Grey with caramel notes), a piping bowl of their wonderful tomato bisque, and their tower of yummy pastries and finger sandwiches. I know simply EVERYONE makes mini pound cakes and bundt cakes in different flavors (Boring, right? ), but their mini bundt cakes are amazing! I don’t know who is back there baking, but they sure know what they are doing. 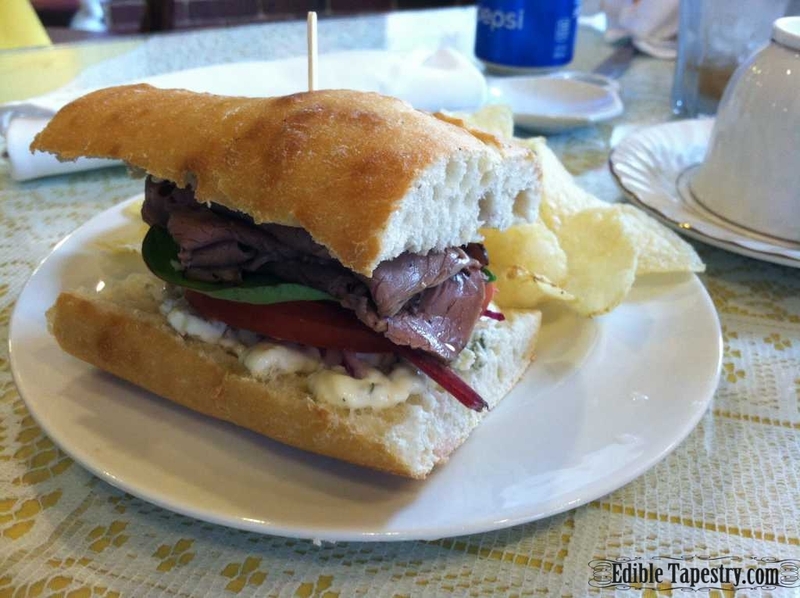 And for those who aren’t tea and finger sandwich consumers, they have a couple of pretty massive full-size sandwiches and even sodas on the menu. 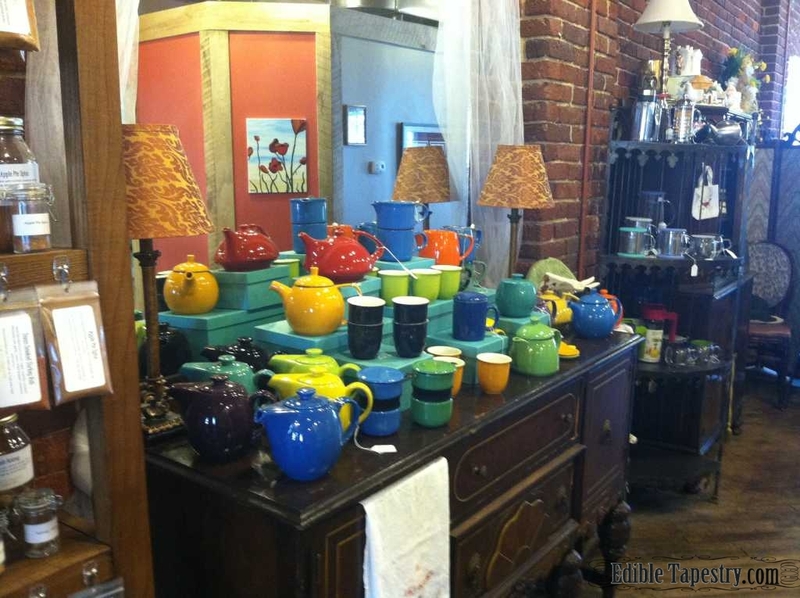 Not just a tea room, The Tea Shoppe, as the name implies, also sells loose teas and tea making accessories. And I am running low on my stash of Dorian Grey, so I think our next trip can’t come soon enough! Mom and I are doing some traveling together soon, so I will be “working hard” to find lots of places to blog for what MUST be my next tea post, “Tea Sipping Abroad”. We have road-tripped a lot over the past four years. Traveling back and forth from our little mountain farm to the bigger dairy farm in West Virginia we were dividing our time between while my husband worked on a contract, frequent trips to New England for work, and family visits in Colorado, Montana, California, and Florida have kept us feeling a bit like nomads. Road-tripping when, to where, and for the length of time we choose is the ultimate work-from-home perk! But being the frugal wannabe homesteader that I am, when we aren’t staying with family or in work provided hotel rooms, the majority of our hotel stays come with unhealthy, carb-loaded free breakfasts, and an in-room microwave, coffee maker, and fridge (not hard to find at all, these days). When we are on the road, the majority of our meals are eaten in our vehicle from grocery store purchases and homemade non-perishables. When we aren’t at a hotel that includes breakfast, I pack a few dozen breakfast scones, cookies, and biscotti that I make, which are loaded with healthy grains, seeds, nuts, and fresh and dried fruit, along with the double chocolate biscotti and almond biscotti that we always keep on hand for coffee sipping and dipping, a jar of instant coffee and powdered non-dairy creamer, and boxes of the herbal teas we drink every day. Lunches and dinners mostly come from grocery store supplies, with special splurge dinners out at restaurants here and there, or fabulous diner breakfasts on occasion, because the best thing about traveling is certainly finding great food! 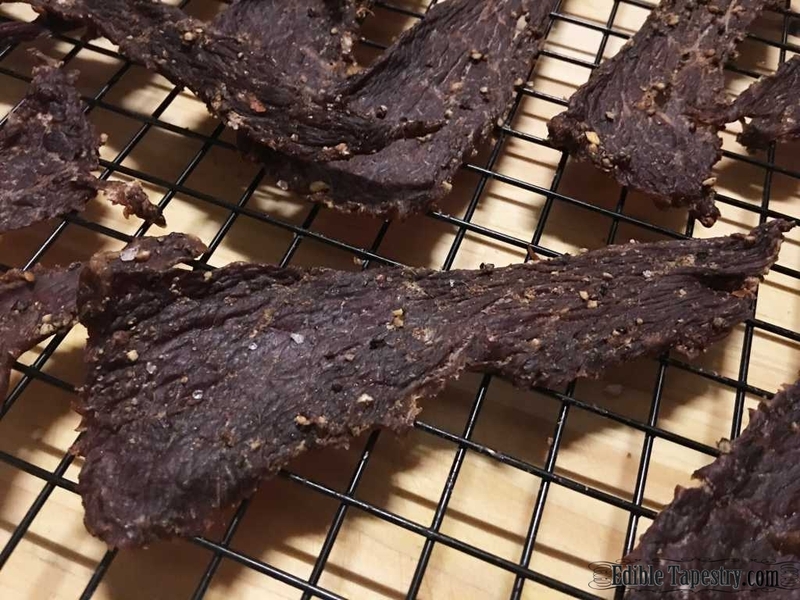 One thing I always try to make before a road trip, winter storm, hurricane, or camping trip is homemade beef jerky, in the same manner my dad taught me to make it when I was a kid. It’s a cinch to make and the flavor beats any and all of the sweet soy sauce saturated, expensive versions for sale in supermarkets and convenient stores. 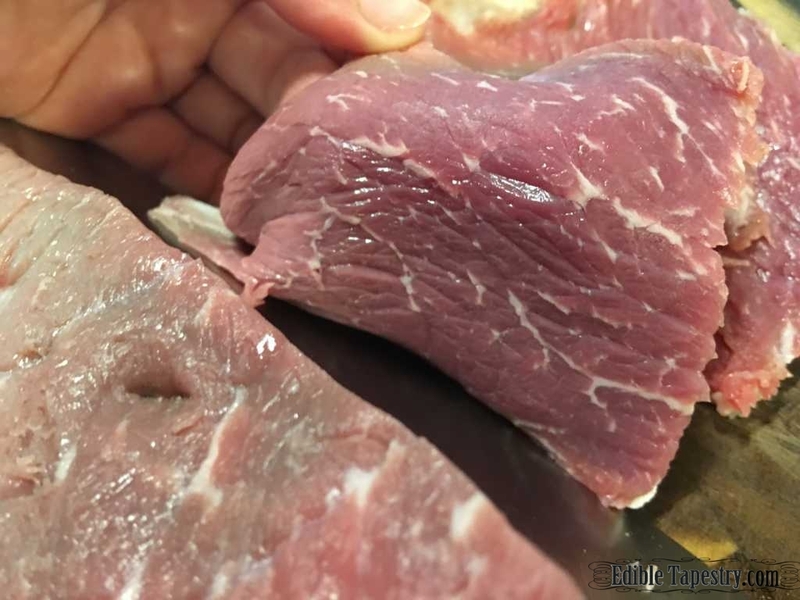 I have used every cut of beef there is from London broil to chuck, top round, bottom round, sirloin…and the results are always the same. 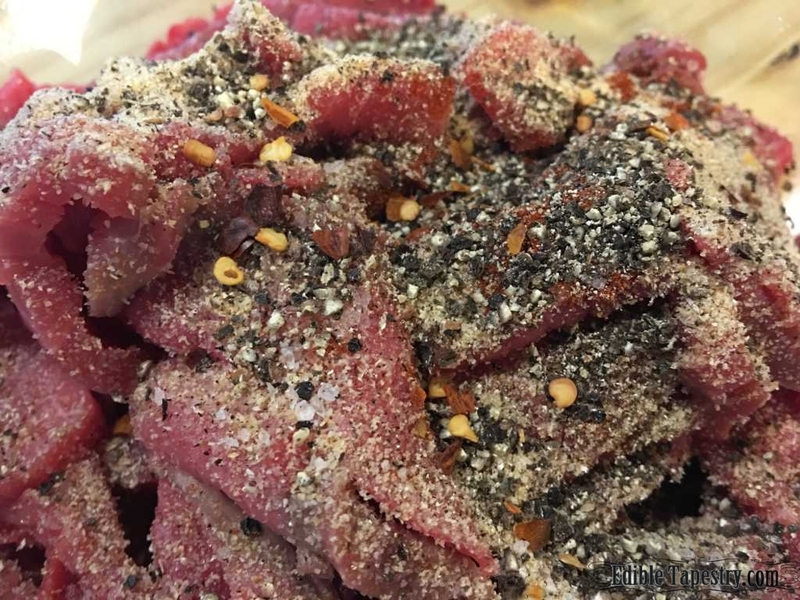 I end up with a wonderful batch of peppery preserved beef that helps us keep the traveling carbs a bit balanced with a handy supply of protein and gives us something other than canned meats to eat if the power goes out in a storm. I have made it in an electric oven set on the lowest setting. For mine, that is “low” and 170 degrees fahrenheit. On a gas range with a continuously burning pilot light in the oven, I don’t even need to turn it on. 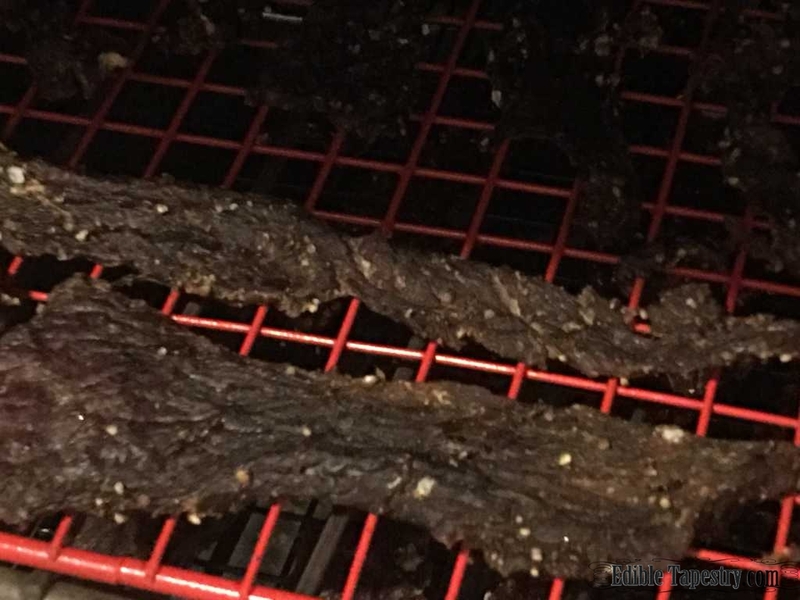 The heated dry air is enough to turn raw beef into jerky overnight. Gas ovens with igniters work the same as an electric, working great on the lowest setting to dry the meat. 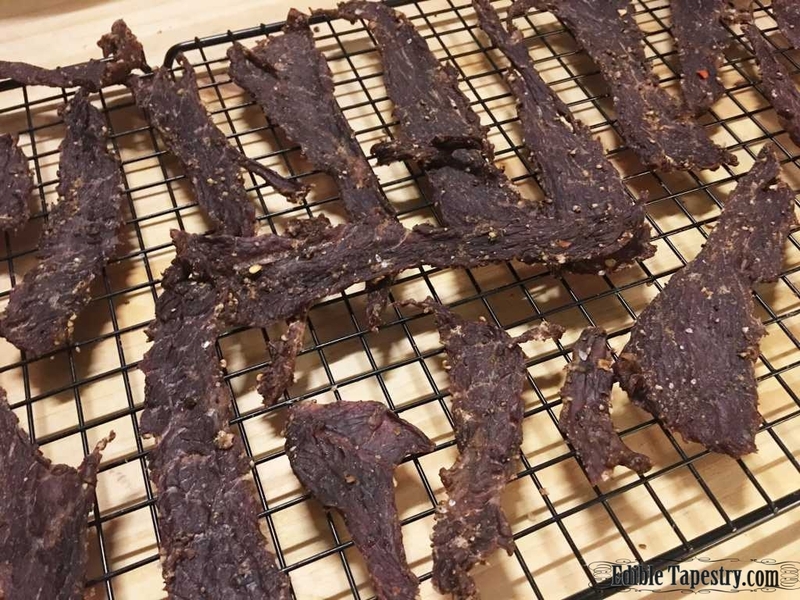 And, of course, sometimes I use a dehydrator to make beef jerky. I have used all four methods to obtain the same results in the same amount of time. 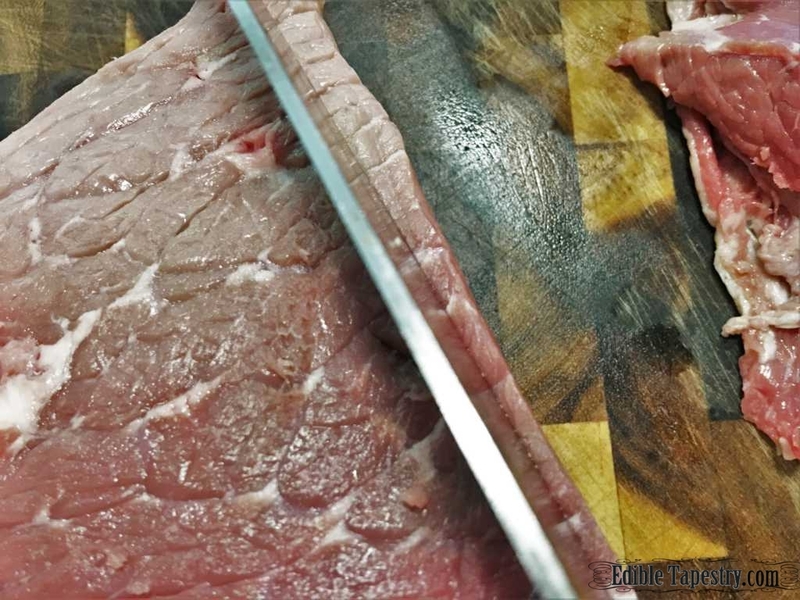 I slice the beef as thinly as possible with a very sharp knife. 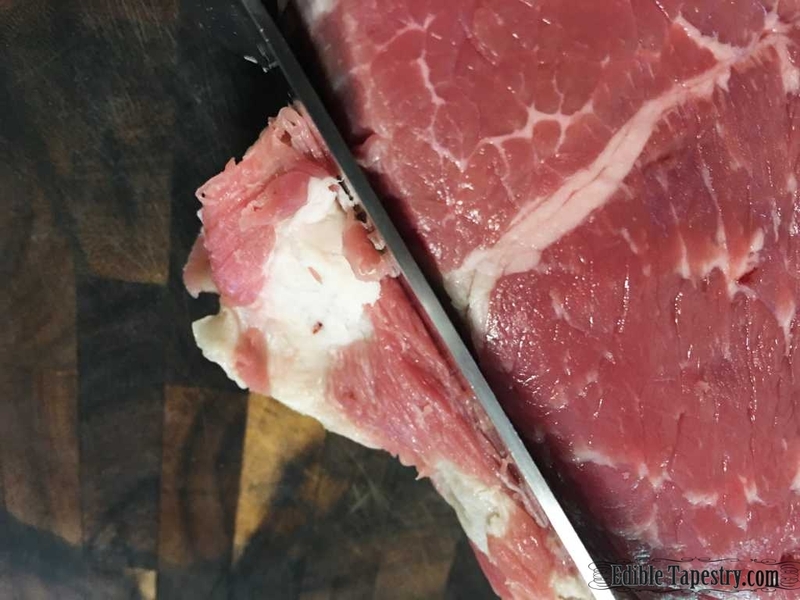 I vary the length and width, but to safely thoroughly dry the meat as quickly as possible, I get it as thin as possible, after squaring off the ends. Then I liberally coat all sides of every piece of sliced beef. I lay it all on baking cooling racks, trying to keep the pieces from touching too much so that air can circulate around them. But the pieces begin drying and shrinking pretty quickly, so I don’t worry too much about how spaced out they are. My oven is set on “low” or to 170 before I place the racks of beef on separate shelves with plenty of space between them. No matter what drying method I use, I dry the meat overnight, 8 hours, or until the beef is completely dry and crackly. Then I cool it completely before storing in airtight containers. When we aren’t eating it, I keep the packaging sealed tightly. 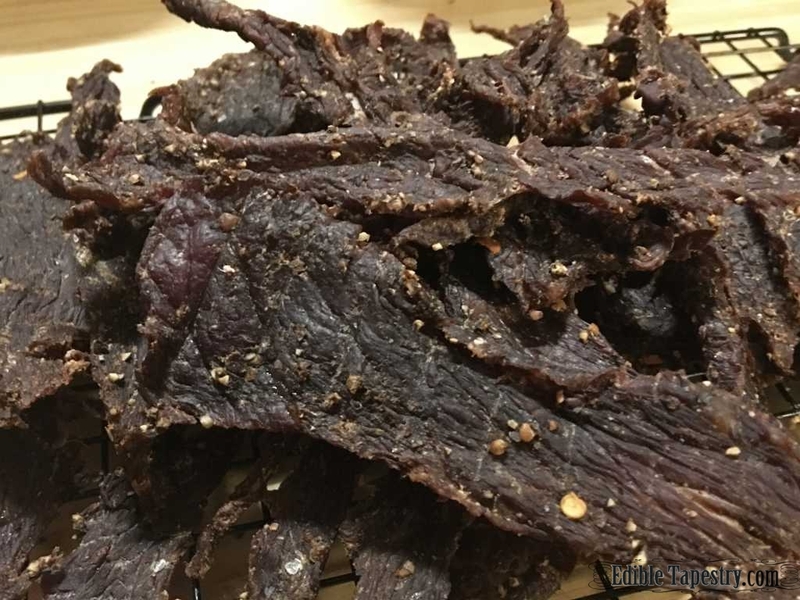 *This method and recipe does not come with any guarantee that pathogens of any kind will be eliminated in the making of beef jerky. E-coli can be present on the surface of any and all portions of beef and the only sure method of destroying it is by cooking it at high temperatures. Ground meat should never be used to make jerky. 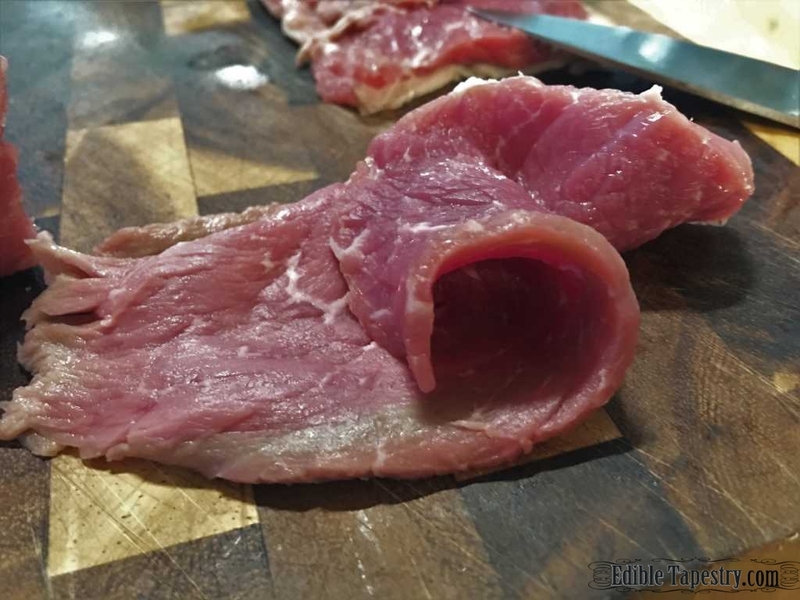 This method is not recommended for any other type of meat than beef. 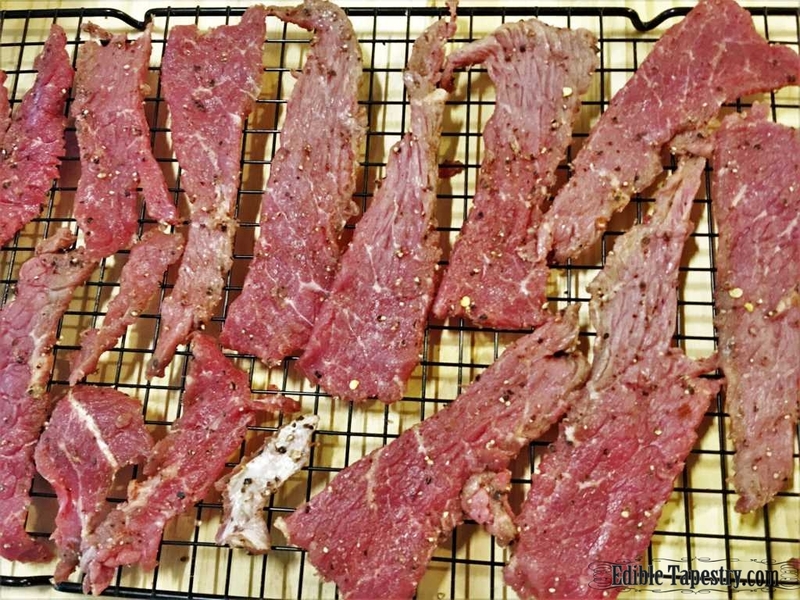 Prepare and consume beef dried using this recipe and method at your own risk. Edible Tapestry is not responsible for any illness that might occur via the method used here by a reader of this blog. 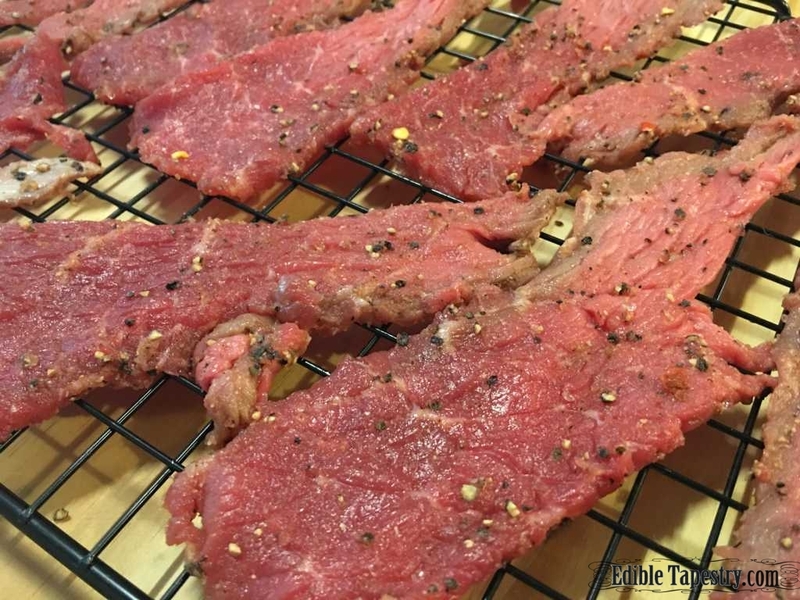 I am simply sharing the method I have always used to make beef jerky, which always results in thoroughly dried beef strips in the same manner that meat has been dried for thousands of years. Yield depends on the size of beef cut used. While not quite a “Janeite”, completely obsessed with all things Jane Austen, I love the above quote. It is so me. Don’t tell me I can’t do something. I will do it, every time. Don’t try to back me into a corner. I’ll mow you over on my way out. Don’t try to put me in what you think is my “place”. I’ll show you where I belong and fiercely defend my right to thrive there. Don’t try to intimidate me. I can be very intimidating, myself. And I think this is why I love Jane Austen heroines –in particular, Elizabeth Bennet– and everything I’ve read about the author. And how can you not just love Mr. Darcy for allowing Elizabeth to be herself and for loving her for it, in spite of his initial feelings of superiority. And, a man who admits his faults? I’m just old-fashioned enough to feel weak-kneed at the idea. 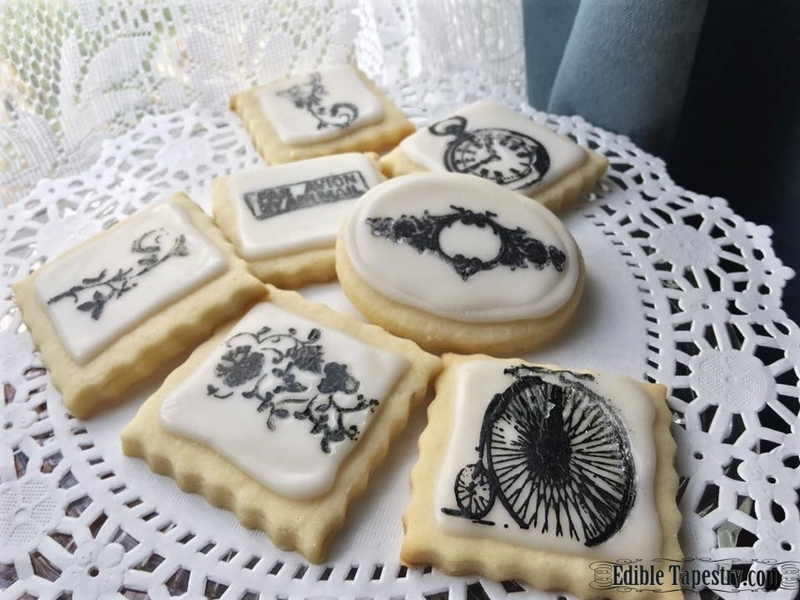 These dainty little sugar cookies were intended to be cameo-style oval shapes, decorated with black icing stenciled from templates I drew and cut from sheets of transparent stencil plastic. I have been making stencils since I was a teenager obsessed with colonial decor and all the fun country stenciled things that were popular in the late 1980s. 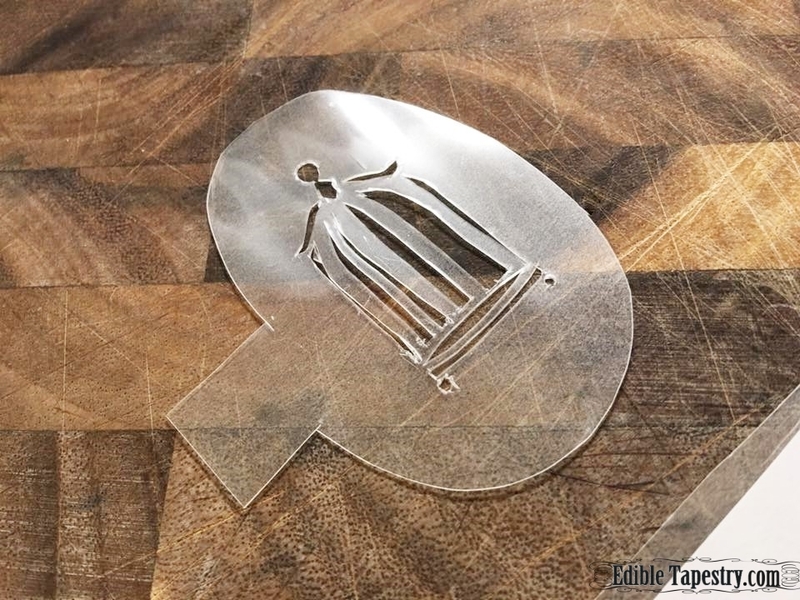 All you need is an idea of the image you want to create, a sturdy sheet of plastic or cardboard, a cutting board or surface that you don’t mind gouging and slicing up pretty good, and a very sharp blade. I have always used an X-acto knife. 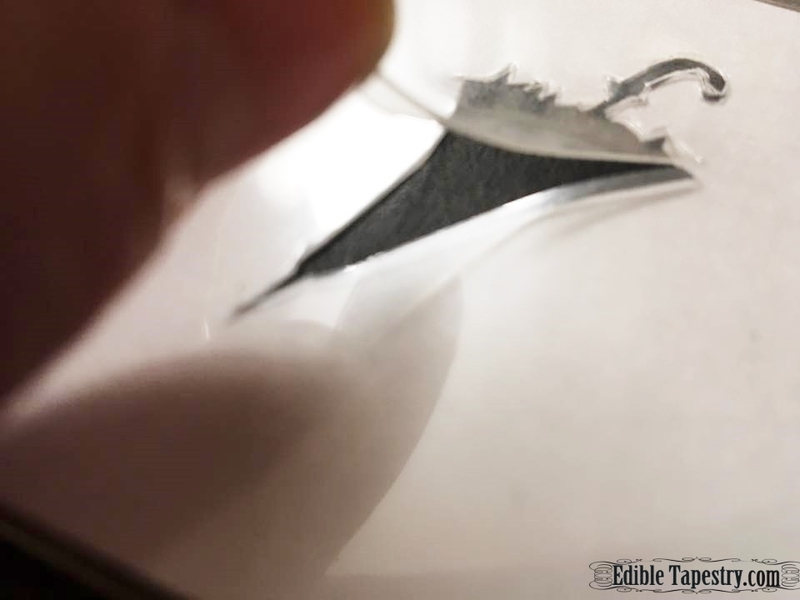 The only tricky part is deciding which portions of your image will need to remain connected to the sheet of plastic and which will be cut away. If you are good at drawing, no problem. You can decided how your finished image should look. Just place the image you would like to turn into a stencil behind the transparent plastic. 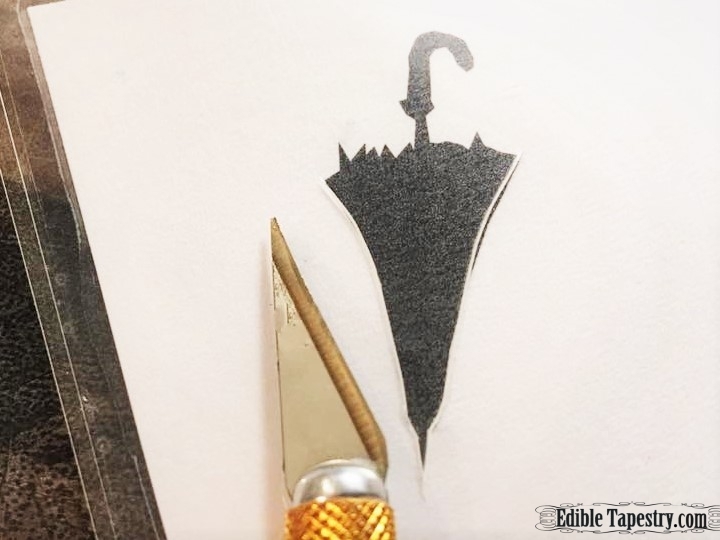 Use a craft knife to cut along the outside edges of the image. Pop out the cut plastic. 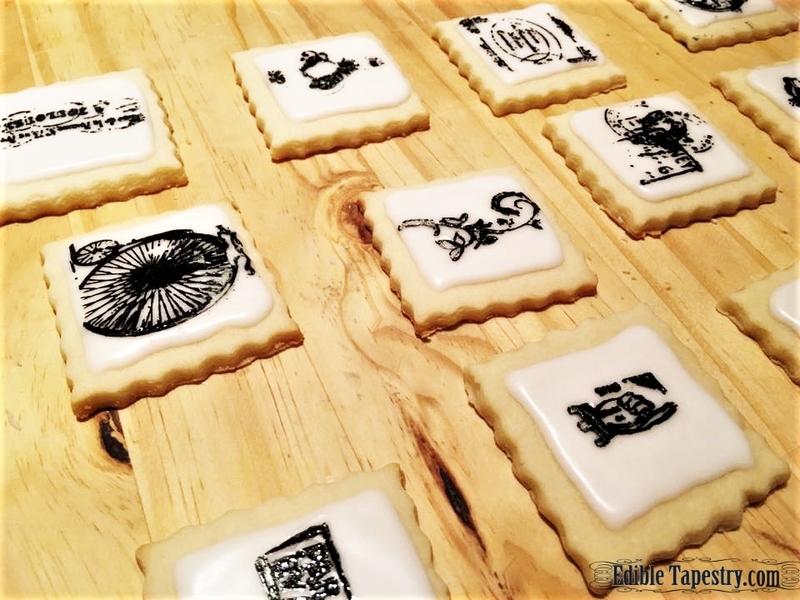 In addition to using some of my stencils, I also used rubber stamps to make these cookies. My local art store had so many to choose from that I was able to stay within my theme for this post while throwing a little steampunk fun into the mix. 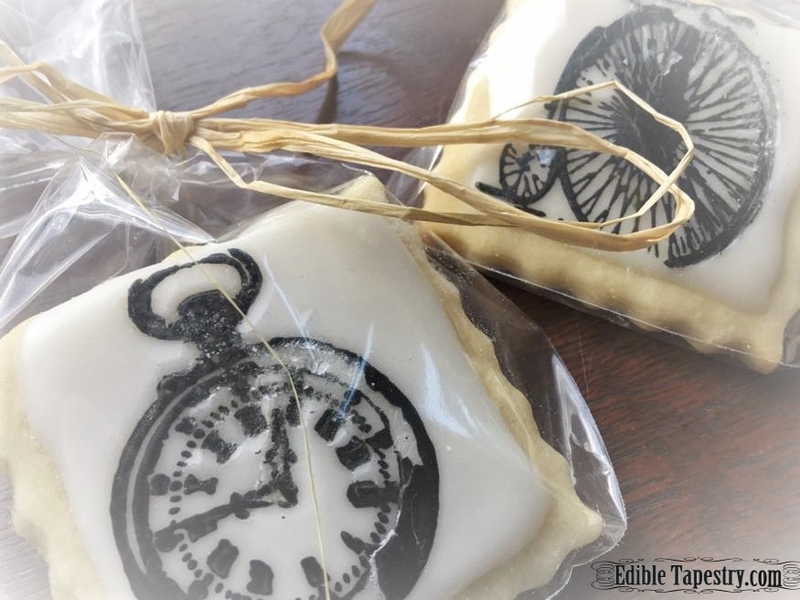 My bicycle cookie is about 20 years ahead of Lizzie’s time but was invented just three years after the book was published, so I included it. 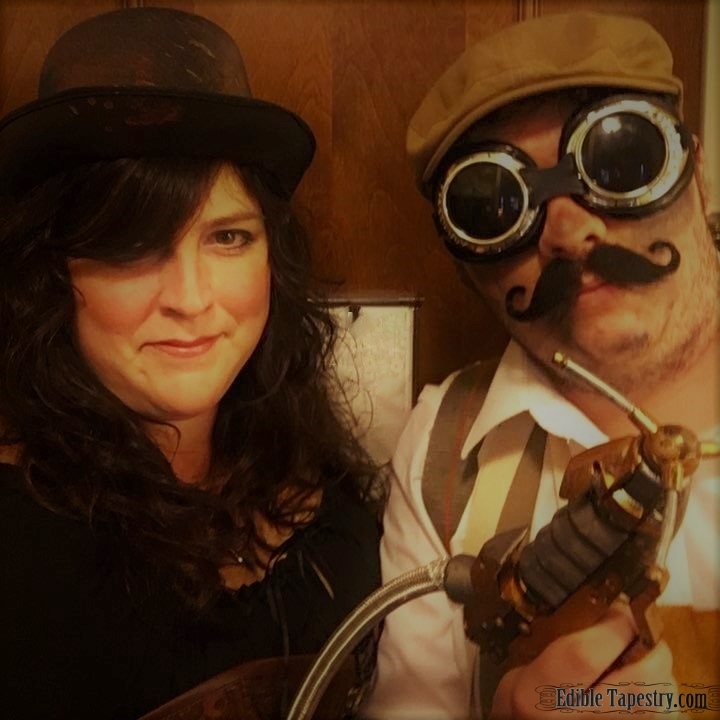 My family members and I are steampunk nuts, attending steampunk conventions every chance we get. 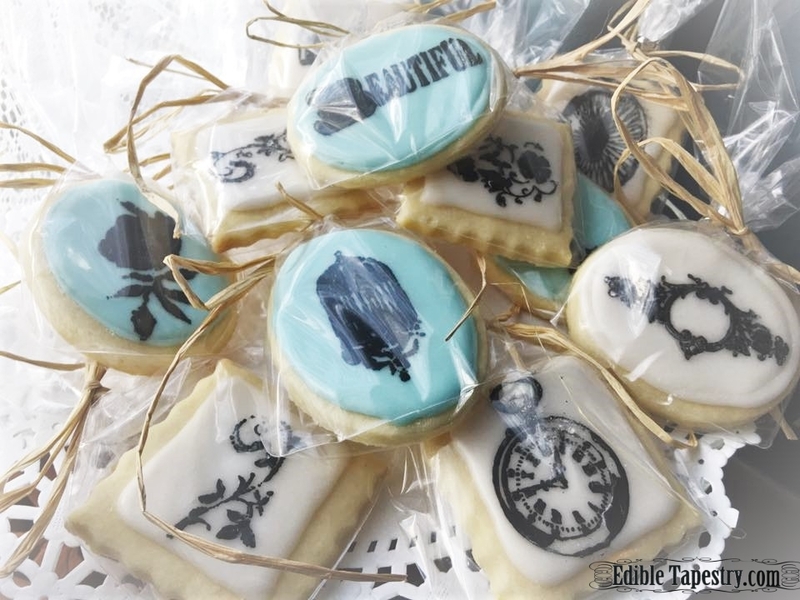 So I am suddenly seeing cookie vending at a steampunk con a possibility in my future, with these fun creations. And while black velvet or satin ribbons would have been ideal to use to tie up my little cookie packages, if I were selling them at an event, I kept them humble and “lower class”, in honor of Elizabeth Bennet, by tying them with the natural raffia that I love so much in my every day life. 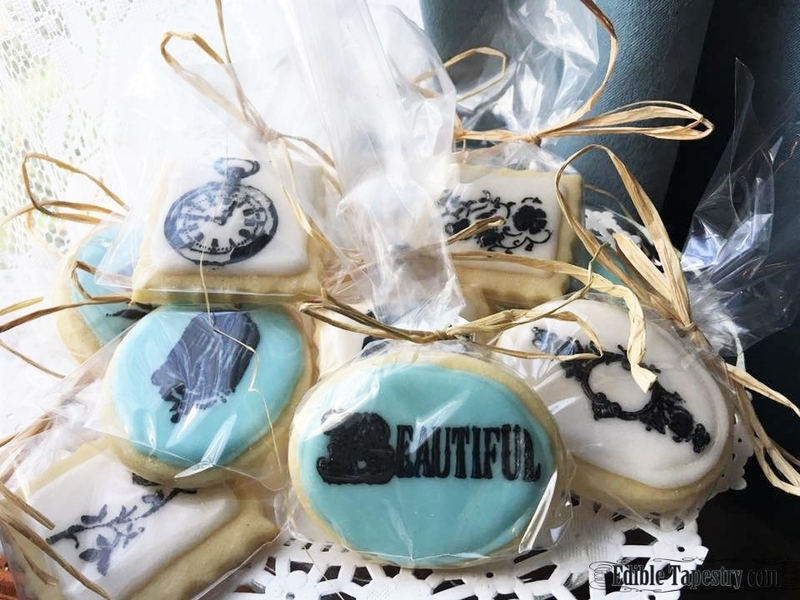 Perfect for an 18th or early 19th Century themed book club meet or a later century, Victorian themed event, these cookies would even work well for an Alice’s Adventures in Wonderland Mad Hatter tea party. 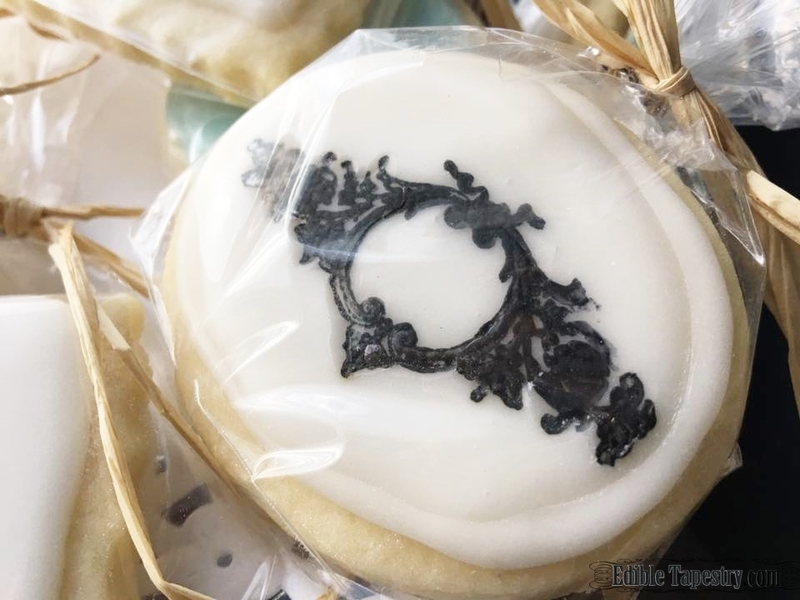 The cookies need to be made at least two days in advance, as both the thick royal icing base and the additional stamped decorations need plenty of time to dry before being handled and packaged. 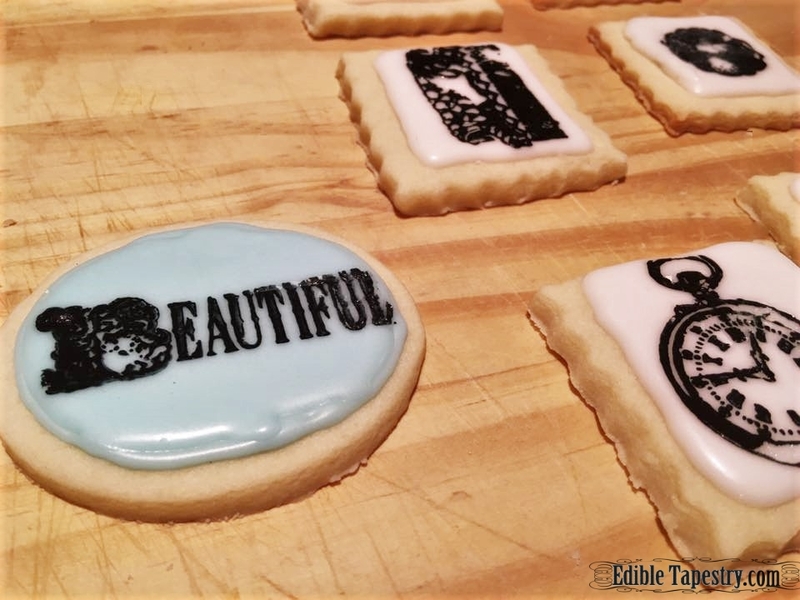 I used thinned black Wilton icing color for the stamps and stencils. 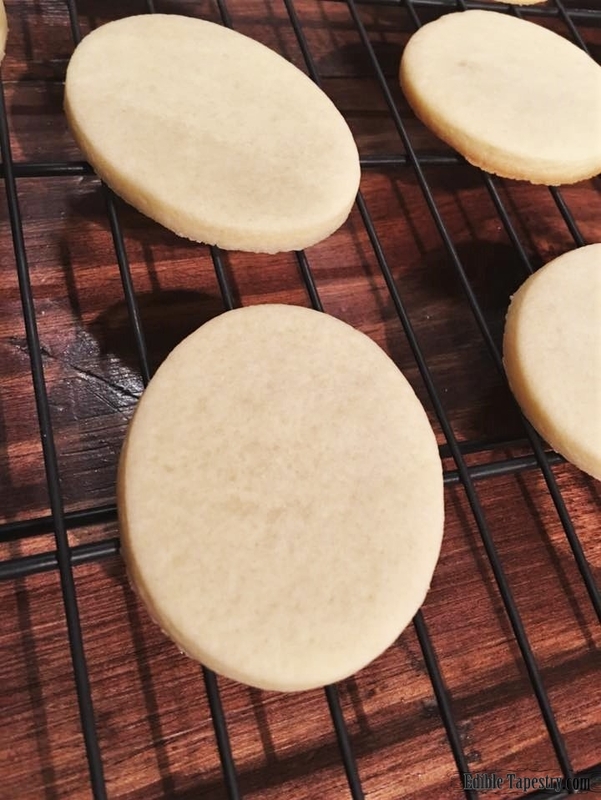 You can speed up the drying time by placing the iced cookies in a dehydrator for a few hours. 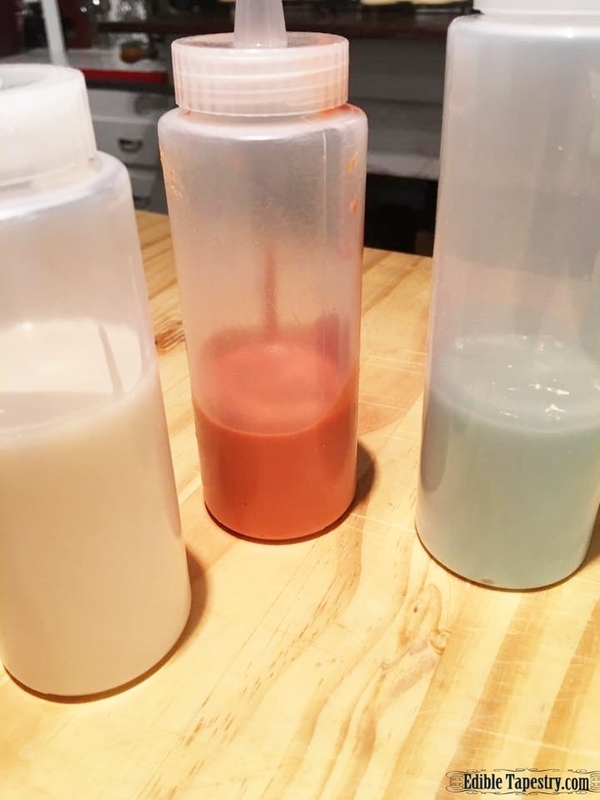 Mixing the color with vodka or alcohol-based extract, like vanilla, to thin it, helps the moisture to evaporate off the surface. A dusting of confectioner’s sugar also advances the drying time. The cutters I used were between 1 1/2 to 2 inches, length and width. 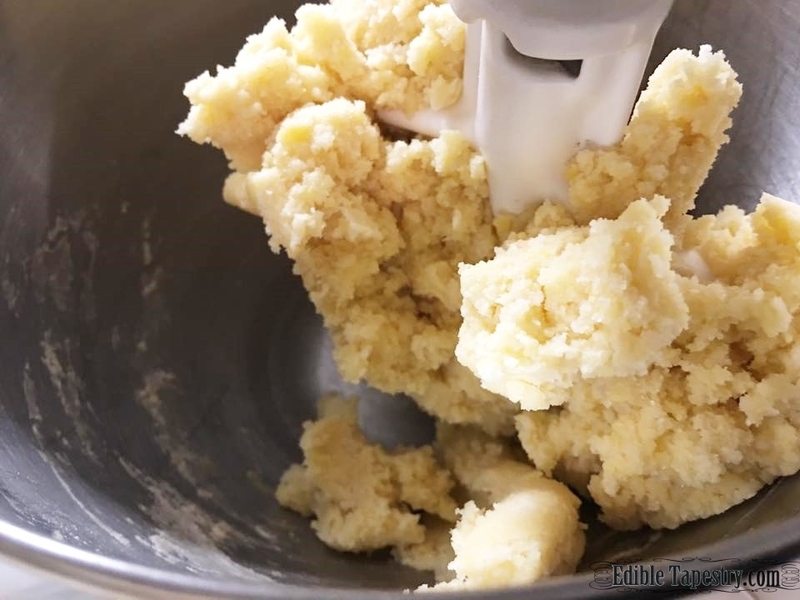 The cookie dough does not spread during baking but makes firm, sturdy cookies that hold their shapes and have clean edges and corners, making them ideal for icing. 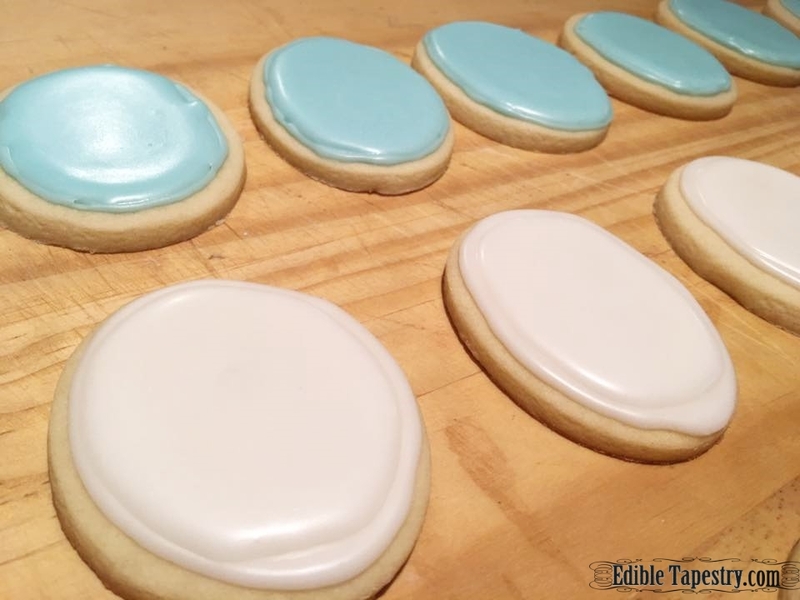 Gel icing colors (I use Wilton.) in royal blue, teal, and black. Additional flour for rolling out the cookie dough. Additional confectioner’s sugar for dusting iced cookies. Heat oven to 350 degrees F. Cream the butter and sugar together with a mixer. Whip in the egg until light yellow and thickened. Beat in the vanilla extract. Sift together the dry ingredients. Add to the creamed mixture. Mix just until moistened and the dough comes away from the walls of the bowl. Cover and chill for at least an hour. Roll on a floured surface to 1/4 inch thickness. 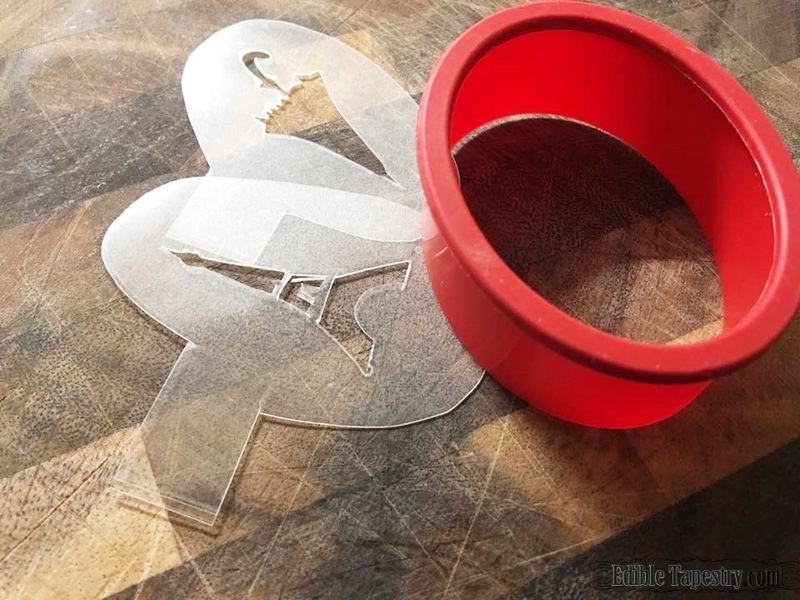 Cut with cookie cutters, placing each cookie one inch apart from the others on silicone baking mat or parchment lined cookie sheets. Bake for 10 minutes, or just until the edges begin to turn golden and the cookies are firm. 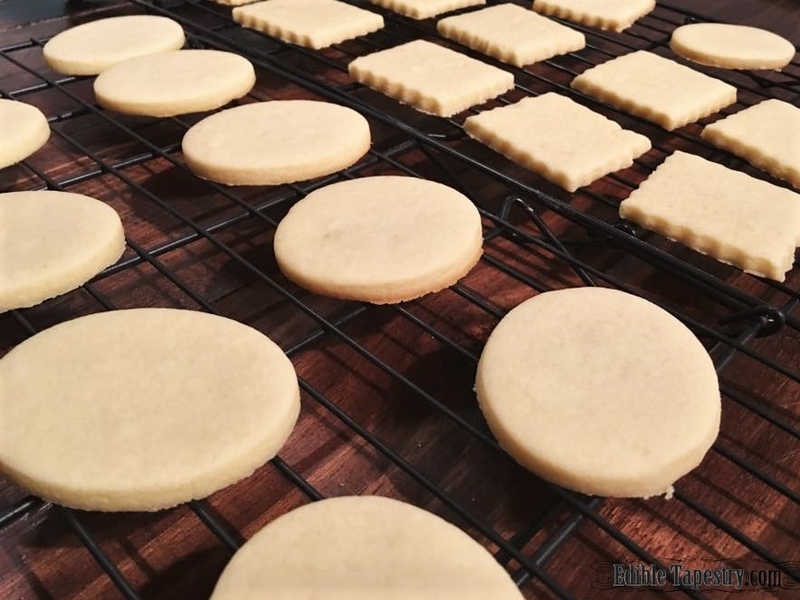 Transfer the cookies to cooling racks and thoroughly cool. 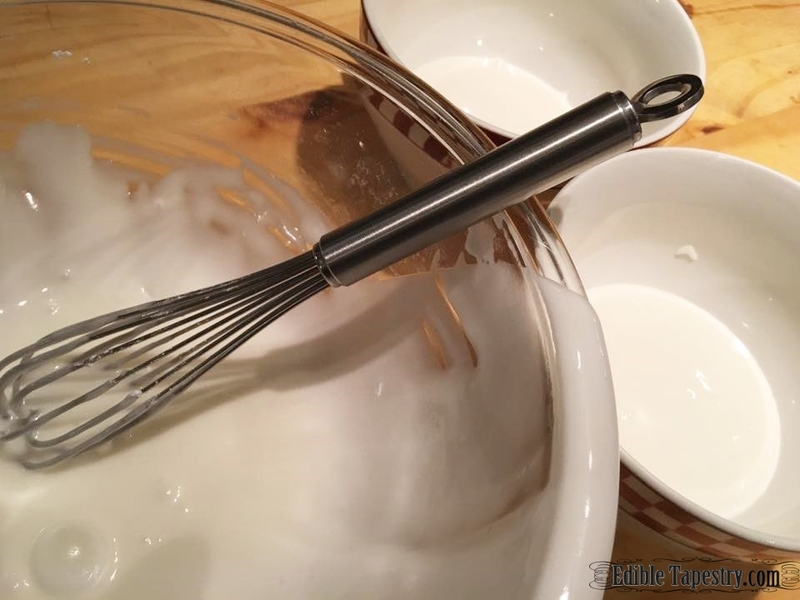 Make the royal icing by whisking together the meringue powder, cream of tartar, and weighed and sifted confectioner’s sugar. Stir in the vanilla extract. Whisk in the water a little at a time until the icing is thick but still a bit runny, so it can flow through a squeeze bottle or small piping tip. 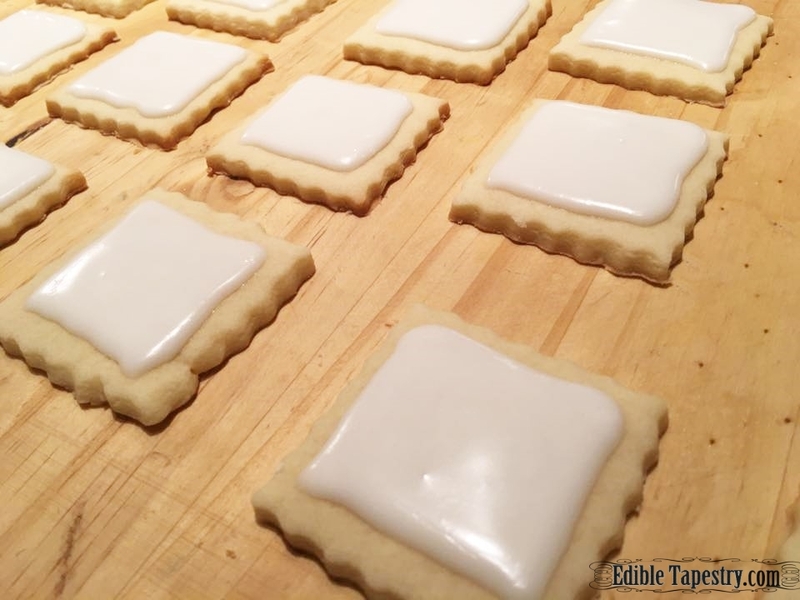 Divide the icing into one, two, or even three, to make different colored batches, if desired. Add color until the icing reaches the hue you are looking for. 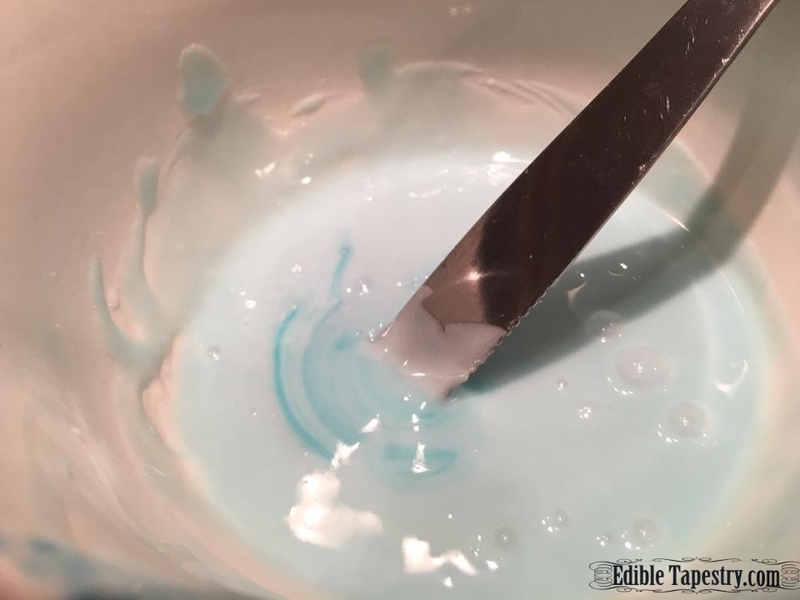 To make the robin egg blue icing, I barely dipped a table knife into royal blue icing colors, then repeated with teal. 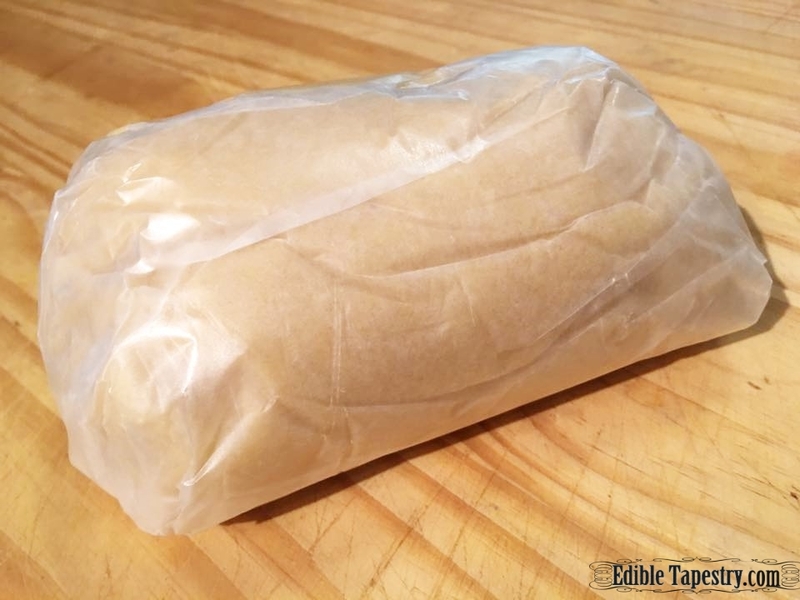 Place each type of icing in a squeeze bottle or piping bag fitted with a small round tip. 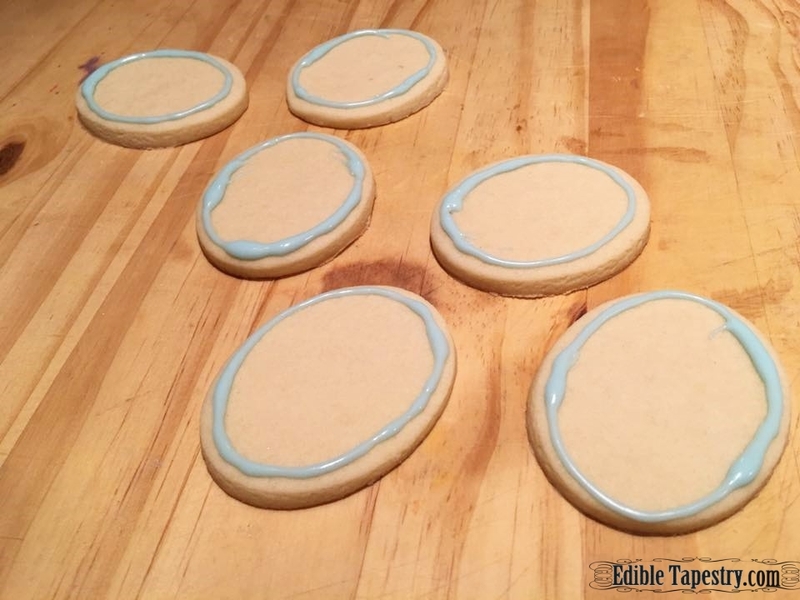 To ice the cooled cookies, make a dam around the edge of each cookie with a bead of icing. Then flood the inside of the dam with a nice puddle of icing. 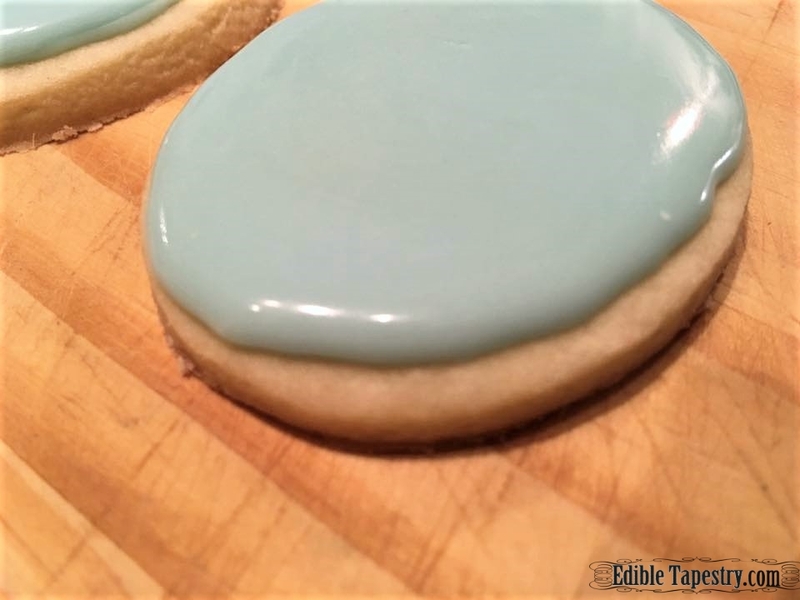 You can wait a few seconds after piping the bead to let it dry a bit, preventing any of the icing from spilling over and out to run down the edge of the cookie, but the cookies will not have as smooth an appearance as if you fill them immediately after piping the dam. 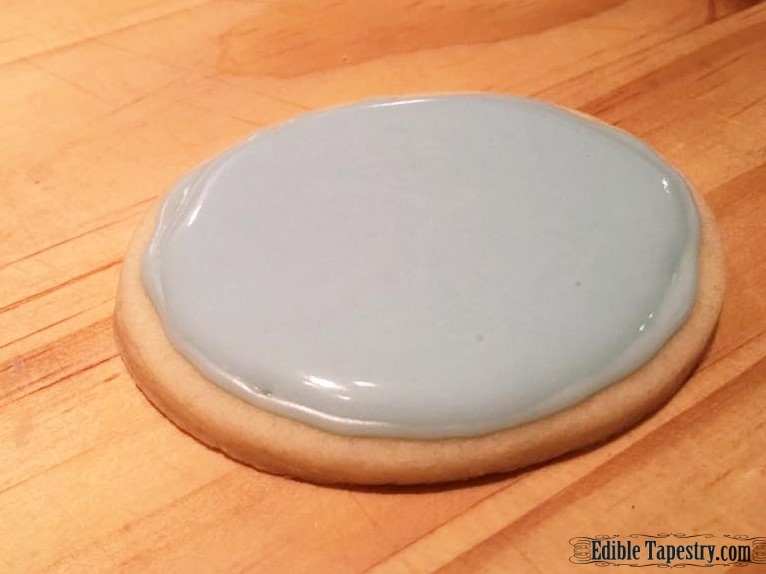 I like the look of a completely smooth top as well as a nice bead border around each cookie. So preference is up to the baker. 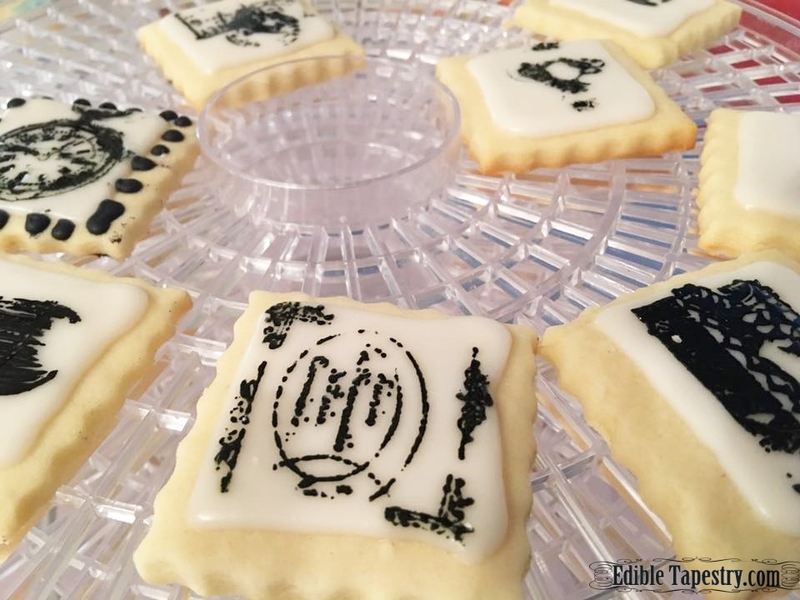 Allow the cookies to dry overnight before stamping or stenciling. A dehydrator helps the process along, but since heat builds inside my dehydrator, I put several empty trays between my cookie trays and the heating element of my unit. I also left the vents on the lid open to prevent a build-up of heat. 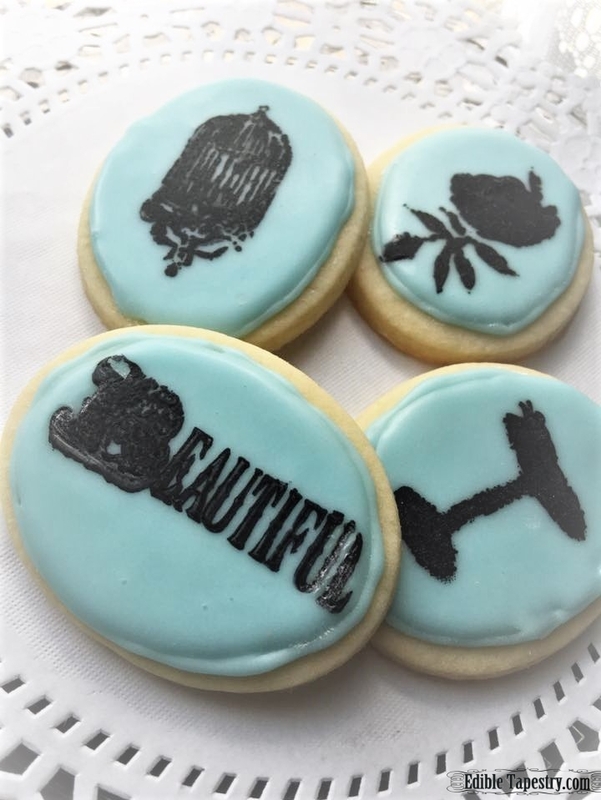 Using thinned black gel color, stamp or stencil away to your heart’s content, using any cookie stencil or craft stamp you’d like. Allow the embellishments to dry for an hour in the dehydrator. 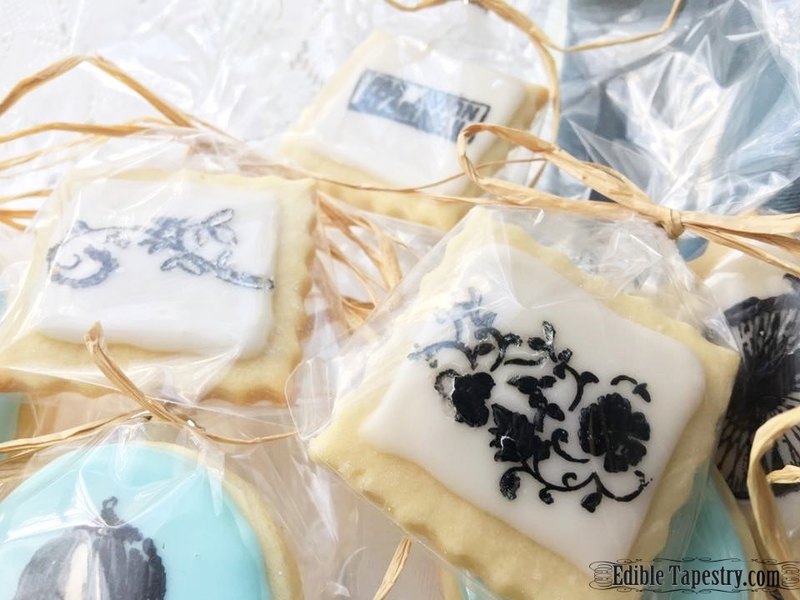 Using a pastry brush lightly dipped in confectioner’s sugar, dust the top of each stamped or stenciled embellishment, then lightly rub it with your finger to help your image lose some of the chalkiness created by the dusting of sugar. Store in air-tight containers or treat bags. Yield: Between 2 and 3 dozen cookies, depending on the size of the cutters used. Send me your email address so I can turn your inbox into a recipe box!